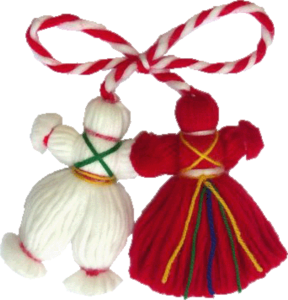 On the first day of March and for a few days afterwards, Bulgarians exchange and wear white and red tassels or small dolls called “martenitsa”. The red and white woven threads symbolize the wish for good health. They are the heralds of the coming of spring. While white as a color symbolizes purity, red is a symbol of life and passion, thus some ethnologists have proposed that, in its very origins, the custom might have reminded people of the constant cycle of life and death, the balance of good and evil, and of the sorrow and happiness in human life. This is an old pagan tradition that remains almost unchanged today. The common belief is that by wearing the red and white colors of the martenitsa people hope that it will make winter pass faster and bring spring. Many people wear more than one martenitsa. They receive them as presents from relatives, close friends and colleagues. Martenitsas are usually worn pinned on the clothes, near the collar, or tied around the wrist. The tradition calls for wearing the martenitsa until the person sees a stork, a swallow or a blooming tree. These three symbols are considered harbingers of spring.